Sore muscles, aches, and pains are considered part of anyone’s everyday life. That said, everyone wants to know the most effective medications that can help relieve such pain. There are various ways on how you can manage painful and sore muscles. Two of the leading pain relief medications on the market today are Biofreeze and Icy Hot. While these two products may have the same target, they are very different regarding how they work. If you are in doubt, about which product you should use, read on and let’s find out which product is better. Biofreeze vs Icy Hot – Which is Better for Muscle? 1. What Makes Biofreeze and Icy Hot Similar? 2. How Do Biofreeze and Icy Hot Differ? 4. Which Pain Relief Product is Better? Biofreeze and Icy Hot are both suitable for mild to severe localized pain relief. Both products can be applied directly to the affected area of the body. Also, these products have the same active ingredient which is menthol. The menthol content of these products will penetrate into the skin which will instantly provide pain relief. So, how does menthol do this? Menthol can alter the brain’s perception of pain interacting with nerve fibers located under the skin. As a result, it can deliver efficient and fast pain relief to sore and painful muscles. Biofreeze is a topical analgesic that makes use of the cooling effect of its active ingredient which is menthol. It can efficiently soothe minor muscle pain as well as joint pain through cold therapy. The science behind Biofreeze is based on two theories – gate control theory and stimulation of cold receptors. Particular receptors under our skin are responsible for transmitting pain signals towards the brain through the spinal cord. With the gate control theory, when Biofreeze is applied to the painful area of the body, it creates a cold sensation which can override the pain signals. Another theory the backs the science of Biofreeze is the stimulation of cold receptors. When applied to the affected part of the body, its main ingredient, menthol, binds with the temperature sensitive receptors in the skin. As these receptors are activated, pain signals are modulated through the body’s natural pain relieving system. Such mechanism is similar to ice, but with a few additional benefits. This product can also be used together with other pain relief methods like massage, physical therapy, and chiropractic therapy. 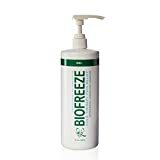 Biofreeze is also less irritating compared to Icy Hot, as it does not contain methyl salicylate. So, How about Icy Hot? Icy Hot is another topical pain reliever that is commonly used to manage minor arthritis pain, sore muscles, and aching joints. This product is available in different formulations including gel, spray, and patch. The active ingredients of this product include menthol or a combination of methyl salicylate and menthol. These elements create a cooling sensation followed by a warming sensation, which can reduce pain through blocking the pain signal that is sent to the brain via the spinal cord. The cooling sensation will help dull the pain while the warming sensation will relax the affected area. Regardless of your product of choice, you have to be cautious about how you use it. Here are some notes to remember when using Biofreeze and Icy Hot. You have to read the ingredients of the product and make sure that you are not allergic to any of its components. You have to use the products only as directed on the label or as instructed by your healthcare provider. You should not use the products in larger or smaller amounts or for a more extended period than the recommended duration and dosage. You should not administer the medications within an hour before or perhaps 30 minutes after you take a shower or bath. You should keep the products away from children and store it in a cool, dry place. So, which product is better? The best product would depend on your preferences, as both products are effective. While Biofreeze is more expensive than Icy Hot, but the latter is available in different formulations like sprays, patch, stick, cream, and sleeve applications. Also, unlike Icy Hot, Biofreeze does not leave any strong lingering scent, which makes it suitable for daily use. When it comes to effectiveness, Biofreeze tends to last longer compared to Icy Hot. Icy Hot can wear off quickly and may need to be often reapplied. Also, if you have sensitive skin, you should be cautious in applying this product as both of its active ingredients are considered skin irritants. If you have extra cash to spare, it is best to purchase Biofreeze. However, if your budget is tight, you can always go for Icy Hot, which is an excellent and cheaper alternative to Biofreeze. Now that you know the similarities and differences between Biofreeze and Icy Hot, it not easier to decide suits you best. Both products are useful in providing pain relief to aching and sore muscles. Also, these products are readily available in your local drug stores. Always take note that when you use these products, you should carefully read the label and apply it as recommended on the label or as prescribed by your healthcare provider.